This is a simple and fun project that would make a great, practical teacher gift. Everyone loves a dry erase board (no? 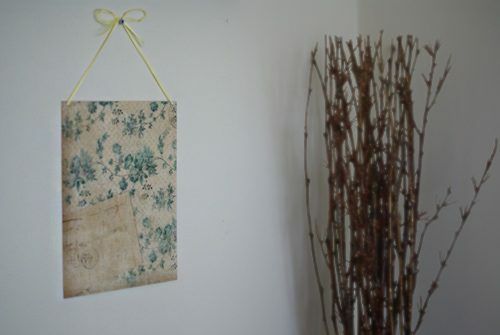 ), and with a piece of plexiglass and a pretty piece of scrapbook paper, you can make a decorative board that’s perfect for hanging on the wall or side of the fridge. 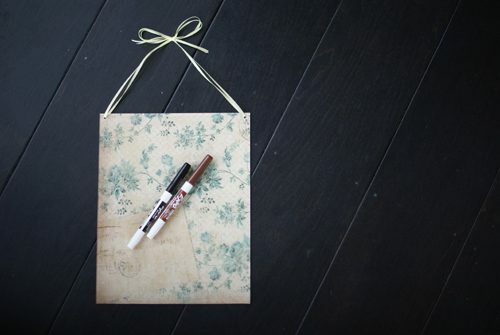 Pair it with some coordinating dry erase markers and an eraser for a simple gift! Drill two small holes in the corners of your plexiglass. Get your scrapbook paper ready and then begin spreading a thin layer of Mod Podge on the back of your plexiglass until it’s covered in even, smooth strokes. Lay the plexiglass on top of the scrapbook paper, working quickly to align the edges. Turn over and smooth any bubbles or wrinkles out of the paper. Let dry completely and then trim the edges with an Exacto knife. Be sure to cut the paper out of the drilled holes as well. Thread ribbon through the corner holes and tie a bow at the top.